Partly and allegedly inspired by a clown prank video created last May by two men from Magione, Italy, it seems that the evil clown craze, spreading through a number of cities in Europe, the UK and the US needed a lengthy incubation period. Or did it? People in scary clown costumes, intimidating and often assaulting innocent citizens. Criminal? Sinister? Undoubtedly. But also ill timed. Days grow colder and shorter, nights seem darker and more ominous. The shadow of Allhallowtide lies upon us. Traditionally, Allhallowtide, All Hallow’s Eve, All Saints’ Day and All Souls’ Day, marks the period during which Christians commemorate the dead. It is a three day festival, a feast, a blend of vigil, prayer, commemoration, fear and mockery. Día de Los Muertos, Hungry Ghost, Obon, are all but different names for the same days of observance, for the same need to honor the departed and to remind ourselves of the ephemerality of life. But piousness and devoutness are often accompanied by irreverence, with paganism and idolatry just around the corner. … ‘Happy Halloween’ is born. Carved out pumpkins, witches hats, white sheets, ghoulish make-up. Scary with a touch of humour. Frightening with a sense of fun. At its best, it is all about candy and dressing up for the kids and inventing a new orange coloured cocktail for the adults. For me, black squid ink risotto will do the trick, followed by a wide-smiling selfie as the treat. Sometimes, Halloween can be synonym of horror. Which reminds me, in Japan, McDonalds has launched the squid ink burger, just in time. And Ronald, I hear you ask? Well, there are no clowns at Halloween. 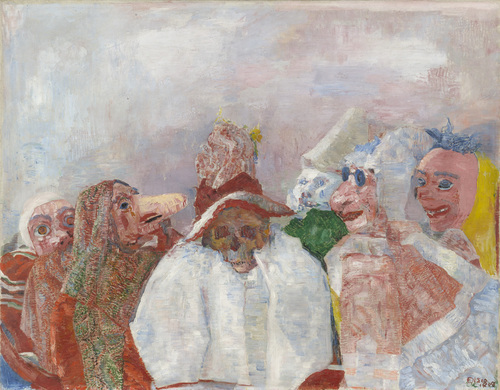 Posted on 30 October 2014 24 November 2014 by MrsCalvo	This entry was posted in Popular Culture and Entertainment, Reality with a Twist and tagged Happy Halloween, James Ensor, scary clown costumes. Bookmark the permalink.